It’s no secret that customer retention and loyalty is extremely important to business. So shouldn’t your marketing strategy target customers beyond the point of purchase to drive further business results? This is where customer lifecycle marketing can help you target existing customers for improved profitability and reduced marketing costs. A greater focus on improving brand loyalty and customer retention can have an exponential effect on company profits. In fact, a study by Bain & Co. reports that increasing customer retention rates by 5 percent increases profits by anywhere from 25 percent to 95 percent. And it makes sense. On top of repeat sales, think about what improved customer retention could mean for your community-building and advocacy marketing efforts. Happy, repeat customers lead to recommendations and referrals, as well as positive reviews and case studies for your company. Repeat customers are key to boosting business outcomes from your marketing initiatives. This is why having a marketing strategy that targets the entire customer lifecycle is so important. 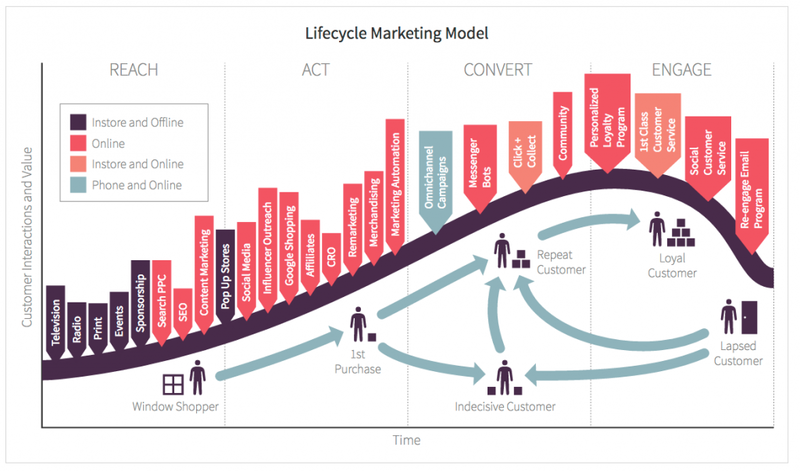 Customer lifecycle marketing can be defined as strategies that aim to attract, convert, retain, and leverage customers in order to increase revenue and drive business growth. Also known as lifecycle marketing, these strategies target customers throughout the buying journey. They focus on the bigger picture, looking beyond the point of purchase to focus on the whole customer experience. Customer lifecycle marketing includes the stages in the marketing funnel from consideration through sales, and extends into retention, loyalty, and advocacy. Here’s a visualization of a customer lifecycle marketing model from Smart Insights that pairs the buyer journey in the marketing-sales funnel with additional stages traditionally included in customer success. 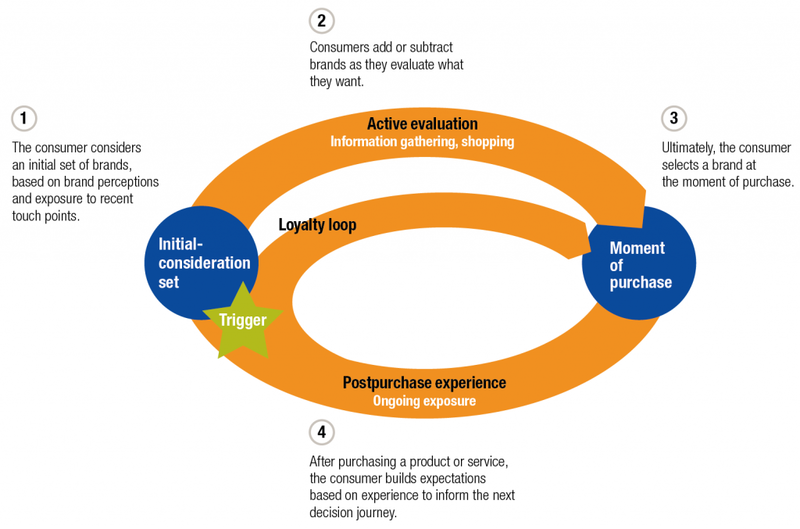 One alternative way to visualize lifecycle marketing is with McKinsey’s consumer decision journey, which employs a circular model to show how the buying process fuels itself and to highlight pivots or touch points. How does it lower marketing costs? It’s crucial for marketers to track their contribution to decreasing business costs. Why? Because marketing is often seen as a center of cost rather than as a center of revenue. Not only do you have to prove that your strategy contribute to sales — you also need to prove that you’re minimizing costs for the business. Increasing the number of customers that buy from you again helps decrease marketing costs. In fact, according to Lee Resources Inc., attracting a new customer costs your company five times more than keeping an existing customer. Having loyal customers is a huge benefit to marketers because when a customer purchases again, there are no new customer acquisition costs, the path the purchase is shorter, and the customer is less likely to need as many touch points before another purchase. Basically, you’ve already invested a lot of effort, time, and money into attracting and converting a customer who has proven that they are willing to purchase your product. The most efficient use of that investment would be to capitalize on it by getting customers to buy again. How does it increase marketing revenue? Gartner discovered that, on average, 80 percent of a company’s future profits come from 20 percent of their existing customers. You want marketing to have a slice of that pie and to take advantage of the huge opportunity existing customers present. Marketing strategies that aim to improve brand loyalty through newsletters, loyalty programs, and other customer lifecycle marketing tactics, can drive customers to buy again. Here’s how to track your effectiveness at gaining repeat buyers using marketing analytics. Track the percentage of customers who return to purchase from your company again. This is the strongest metric for measuring customer loyalty in terms of willingness to purchase again. To track the value of your repeat buyers, compare new customer sales versus returning customer sales. If your returning customers are buying again but spending less money, look at how you can better target them in the future. When reporting on your customer lifecycle marketing initiatives to superiors, you’ll want to forecast the profitability of your efforts. You can do this by calculating your average customer lifetime value (CLV). CLV is a prediction of the total net profit a company makes from a customer over the entire future of their relationship. You can use past performance data to create marketing forecasts that predict average customer lifetime value. Take the average value of total purchases made by customers in the past and use this information to predict future revenue from those customers, taking into account inflation and company growth rates. The benefits that brands reap from developing and keeping loyal customers are significant. From having brand advocates and continual renewal, to purchasing additional products and services, satisfied customers make for a healthy company and a growing bottom line.